Sony reveals details and a brand new video teaser for the sequel to 2009's Game of the Year, Uncharted 2: Among Thieves. It's not the World of Deceit, people. With all of the news regarding an Uncharted movie, we all knew that a second sequel to the Uncharted story would be coming soon, but we've been speculating as to its possible plot and title. Earlier this year, concept art created by an artist-for-hire firm found its way onto the interwebs with the subtitle Uncharted 3: World of Deceit written in large friendly letters. Many people cried fake, but the images were convincing enough for Amazon France to post shot sof the box art and title on its Uncharted 3 pre-order page. 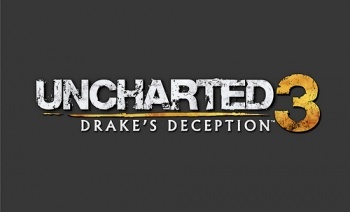 Now it appears that we were all wrong; the real title is Uncharted 3: Drake's Deception. Entertainment Weekly, the TV and movie news magazine, was given a first look at the game at Naughty Dog's studios in Santa Monica, California. The creative director and writer of the first two Uncharted games, and winner of the 2009 Writers Guild Award for Best Videogame Writing, Amy Hennig, said that the Uncharted 3 would heavily follow the theme of deception with Nathan Drake deceiving other characters, he himself being deceived and a mysterious deception regarding Drake's ancestry. The sequel will focus on his mentor, Victor "Sully" Sullivan, while also giving insight into how Drake is descended from the British explorer, Sir Francis Drake. The story takes place in the Arabian peninsula as Drake searches for the lost city of Iram, or as Lawrence of Arabia called it, "The Atlantis of the Sands." No word on release date, but signs point to the tail end of 2011. Not only is Naughty Dog making Uncharted 3's campaign a cinematic experience on par or better than the first two games, but the team is also concentrating on the multiplayer. ""We want to take on the big boys of the multi-player genre," said Evan Wells, president of Naughty Dog. "It has become something here at Naughty Dog that will become an important part to all our games." The Sony PlayStation blog revealed more information about the sequel. "Nathan Drake and longtime friend and mentor Victor Sullivan set off on a daring trek into the heart of the Arabian Desert. But when terrible secrets of this lost city are uncovered, their journey becomes a desperate bid for survival that will force Drake to confront his deepest fears," it reads. It also appears that Uncharted 3 will also follow the party line and offer a full 3D gaming experience. "Uncharted 3: Drake's Deception fully supports high-resolution Stereoscopic 3D." I just recently acquired my own PS3, so I haven't fully experienced the wonder that is Uncharted. With the news of the sequel, I think now is the perfect time to delve into the story that everyone in The Escapist office has been raving about for the last year or so.